Socializing at the Algonquin Hotel; being clever and often quoted. "That woman speaks eighteen languages and can’t say ‘no’ in any of them." The period that followed the end of World War I was one of gaiety and optimism, and it sparked a new era of creativity in American culture. Surely one of the most profound — and outrageous — influences on the times was the group of a dozen or so tastemakers who lunched together at New York City’s Algonquin Hotel. For more than a decade they met daily and came to be known as the Algonquin Round Table. 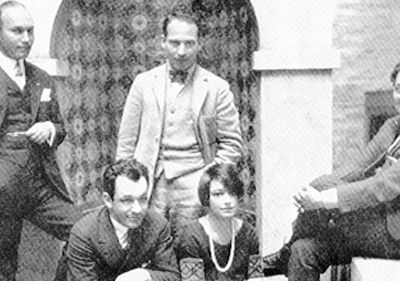 With members such as writers Dorothy Parker, Harold Ross (founder of THE NEW YORKER) and Robert Benchley; columnists Franklin Pierce Adams and Heywood Broun, and Broun’s wife Ruth Hale; critic Alexander Woollcott; comedian Harpo Marx; and playwrights George S. Kaufman, Marc Connelly, Edna Ferber, and Robert Sherwood, the Round Table embodied an era and changed forever the face of American humor. It all began with an afternoon roast of the NEW YORK TIMES drama critic, Alexander Wollcott. 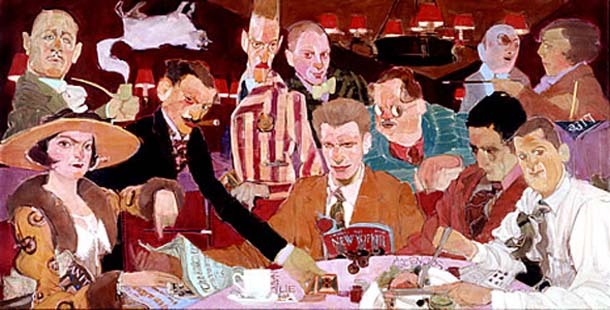 A number of writers met up at the Algonquin Hotel on 44th street and had such a good time that the event was repeated the next day, and the day after that, until the lunch table at the Algonquin was established as a ritual. The core group of friends was sometimes joined by others who attended for short periods or drifted about the periphery of the group, including such notables as actress Tallulah Bankhead and playwright Noel Coward. The Round Table was made up of people with a shared admiration for each other’s work. Outspoken and outrageous, they would often quote each other freely in their daily columns. Round Tabler Edna Ferber, who called them “The Poison Squad,” wrote, “They were actually merciless if they disapproved. I have never encountered a more hard-bitten crew. But if they liked what you had done, they did say so publicly and whole-heartedly.” Their standards were high, their vocabulary fluent, fresh, astringent, and very, very tough. Both casual and incisive, they had a certain terrible integrity about their work and boundless ambition. Some of the most notable members of the Round Table came together to work on significant collaborative projects. George Kaufman teamed up with Edna Ferber and Marc Connelly on some of his best stage comedies, including DULCY and THE ROYAL FAMILY. Harold Ross of THE NEW YORKER hired both Dorothy Parker as a book reviewer and Robert Benchley as a drama critic. As America entered the Depression and the more somber decade of the 1930s, the bonds that had held the group together loosened; many members moved to Hollywood or on to other interests. “It didn’t end, it just sort of faded,” recalled Marc Connelly. A decade after it began, the Algonquin Round Table was over. Not forgotten, the Round Table remains one of the great examples of an American artists’ community and the effects it can have on its time.